An easy and delicious wintery version of sangria: packed with apples, pears, pomegranates, and spiced with nutmeg and cloves. 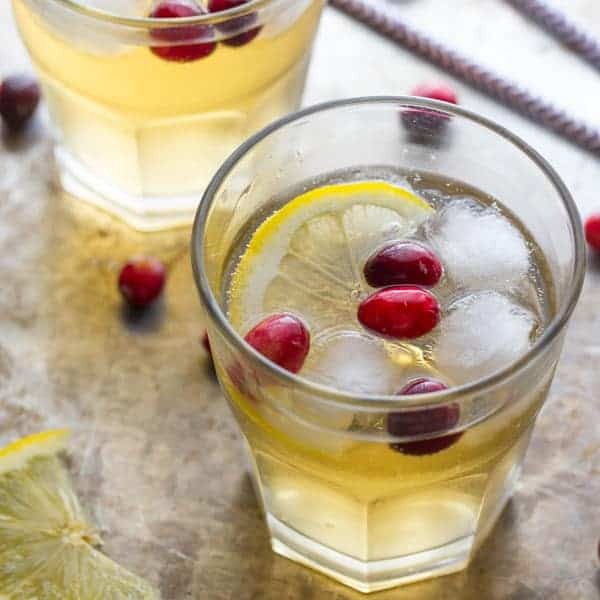 A big-batch cocktail option, perfect for Thanksgiving, Christmas or New Years! 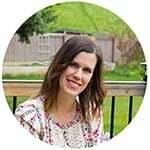 I have a confession…I am a picky eater! My random assortment of dislikes includes the following: mustard, raisins, gold tequila (I have my reasons), egg nog (it has raw eggs in it), bananas, grapefruit and oranges. My dislike of oranges is particularly strong, and I’m not even sure how it started! All I know is that if someone starts peeling an orange around me, I have to leave. I don’t want oranges in my house…not even orange juice! I can’t stand the smell of it, the look of it, any of it! I am completely and irrationally an anti-orange person. For this reason, I have traditionally avoided sangria. Until now. 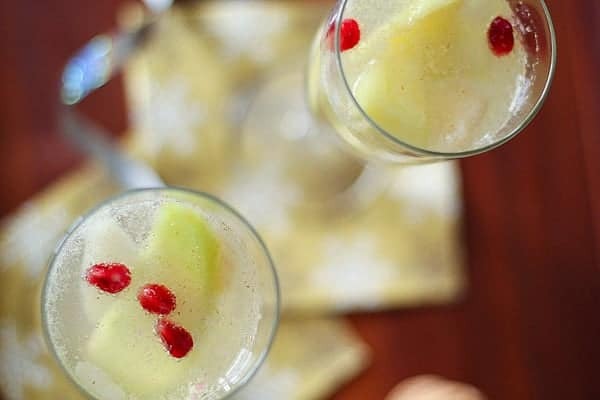 This sangria combines beautiful wintery fruit (Apples, Pears, Pomegranate seeds) with nutmeg and cloves. Most importantly, there are NO ORANGES! The fruit and spices are soaked in white wine for 24 hours. The wine takes on mild fruity flavors…surprisingly the pear flavors were more intense than the apple. The nutmeg and pear combo is divine! I’m taking note of that one. 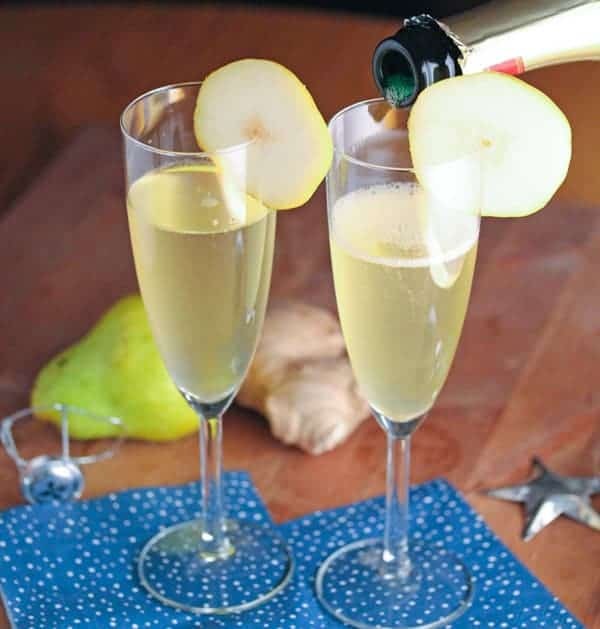 The fruity-nutmeggy wine is then combined with sparkly, bubbly champagne. 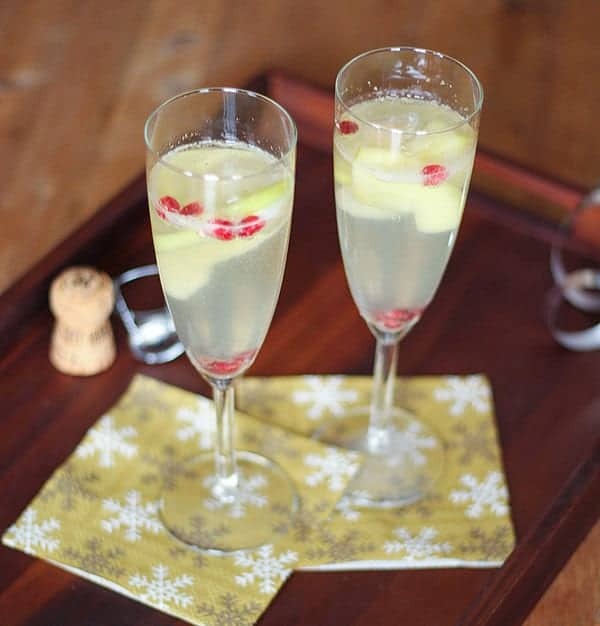 This sangria would make a perfect New Years party drink. 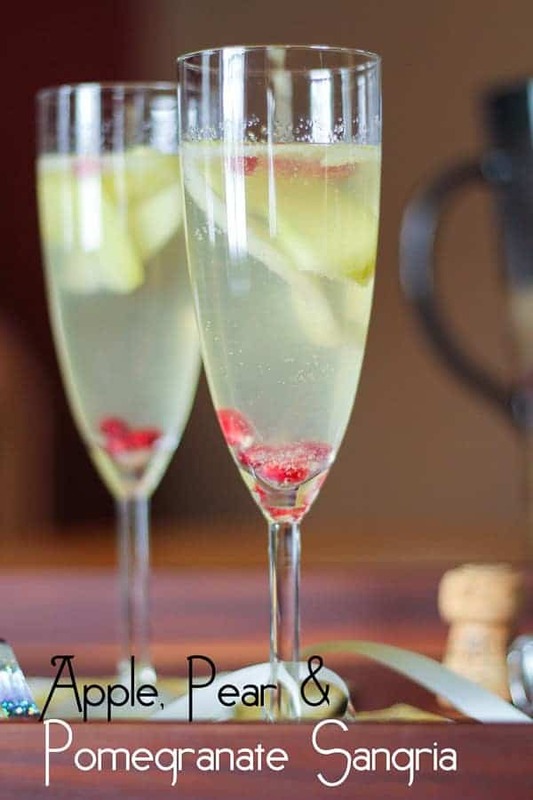 It is sophisticated (although putting pretty much anything in a champagne flute makes it look pretty sophisticated to me), it is pretty, and best of all, it tastes really, really good. Watch out, though, it might not last until midnight! That makes me SO happy, JoAnne! Thank-you so much for reporting back. I hope you had a wonderful Thanksgiving! wow so festive, this would be great to serve on thanksgiving or christmas! Love it! Any tips for making a virgin option of this? 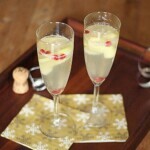 I’m thinking I can serve it with the option of champagne or shloer, which is a non-alcoholic sparkling fruit punch. But what would I ‘marinate’ it in? For some reason cranberry juice comes to mind but that will obviously change it significantly (in a bad way?). Pear juice? Apple juice? Hi Roe! 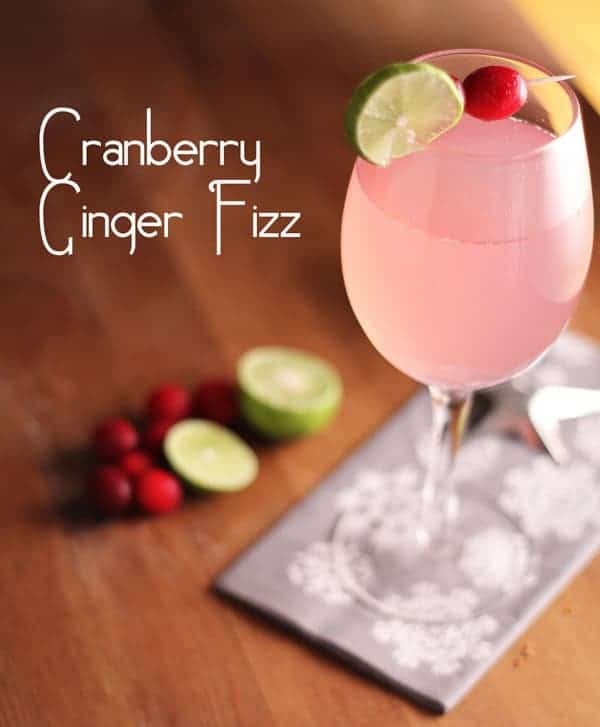 I’ve never served this as a virgin sangria before, but here’s a link with some suggestions using gingerale or sprite with club soda and white grape juice. I think the white grape juice would mimick the wine a bit and the gingerale/sprite will bring the bubbles! If you do go ahead and make it, it would be great if you reported back here to tell us how it turned out! Good luck and happy holidays! Hi! 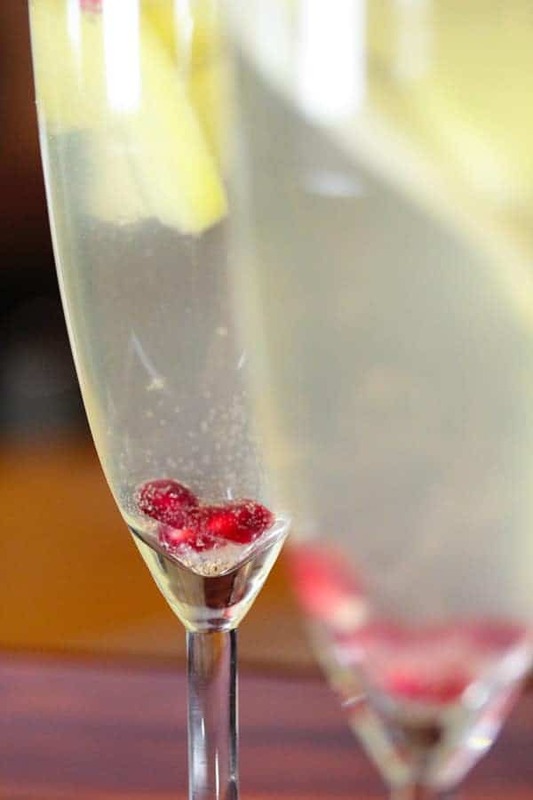 Can you also add in the champagne to the wine mixture instead of pouring it into individual glasses? Thanks! Hi Melly! Absolutely you could do that! I had written it that way because the champagne may be more prone to become flat when poured into the wine, but if you serve it right away it shouldn’t be a problem. can i omit the cloves or are they a must? and if i use them are they a strong taste? I am making this for christmas eve. can’t wait!!! Hi Deborah! I think you’ll be fine to omit the cloves, but make sure not to forget the nutmeg 😉 I hope you enjoy it, it has been far too long since I’ve had it. Maybe I should make a batch for Christmas eve! This sounds great! I’ll have to try it soon. I’m curious; do you also dislike pickles? I have a theory that people how dislike mustard will also dislike pickles. I’m with you on the grapefruit, btw. Fruit should be sweet! Hi Leslie! I actually like pickles, although I haven’t eaten them since I overdid it when I was pregnant (typical pregnant lady, huh?) Glad I’m not the only grapefruit-hater…I really shouldn’t be so picky but I can’t help myself! Hi!!! I’m trying this recipe out right now. Do you remember how large of a bottle of white wine you used? I used a typical bottle you would get 4 glasses out of and it’s mostly fruit in the container. I am making this for tomorrow. I’m wondering if the nutmeg dissolves in the wine or will it taste grainy when you drink it. Hi! Do you leave the cloves in it when served, or do you use a strainer to get them out? Awesome! I hope you and your family enjoyed it! Hi Brya! I believe I used Granny Smith apples but this sangria would be great with all types of apples really. Use whatever you have on hand! Does this call for white wine and champagne? Hi Rena! Yes, this recipe calls for both white wine and champagne. It makes a big batch!